Photographs from the early '50s when I was young. PAGE ONE - Larger images of the camera and image of a strip of film illustrating the half-frame format. 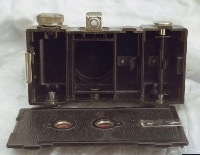 My Mother gave me her Spartus Miniature camera when I first expressed an interest in photography. My memory is that I was about 12 yearsold at the time, but based on these photos from the first roll of film, it was 1954 and I was 13. She may have given it to me for my 13th birthday. The camera used 127 roll film, but it was formatted for half-frame exposures. So two 1 3/4 by 1 1/4 (45mm x 32mm) vertical images were placed on one normal 2 1/2 by 1 3/4 horizontal frame. The resulting images are just slightly larger than the standard 35mm image. It seems that I held the camera horizontally for each photo thus getting a vertical format. A horizontal format would have been better for some of them, but I may have been cautioned to hold the camera horizontally. Back then the conventional wisdom was to photograph with the sun at the photographers back, thus my shadow was in several of the photographs. There was reason for the conventional wisdom. Film speed was low back then and full sun on the subject insured a better exposure. Uncoated lenses were subject to 'flare' when sunlight hit their surfaces. Finally, direct sun on the subjects meant no shadows on their faces. It seems that the view finder covered a much smaller view angle than the camera's lens so that a much larger area is included in the photo than I intended. Another explaination was that I, as a beginner, concentrated my attention on the central area of the view and did not consider the surrounding area of the view. The INDEX at the bottom of the page and the 'thumbnails' have links to larger versions of the photographs and additional description of the scenes. These photos are certainly not high quality and may be of interest only to the family but, if you're interested in how I started in photography, this is it. Dog at south end of house. Black pig in the shadows. Grandpa and Jeanne near Lanty Cemetery. Mom helps Dad move water pump. Baby Sherrye - almost one. Film was cut into strips of four. These were the first, taken in this order. The next four followed, then the others.